The only casino games that give you free rewards from top Las Vegas resorts like the Bellagio, Aria, MGM Grand, and the Mirage. 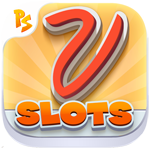 Come and join the Fun at MyVegas Slots! Mobile for Android and iOS. Play on Facebook!